I had forgotten all about how much I love these guys. 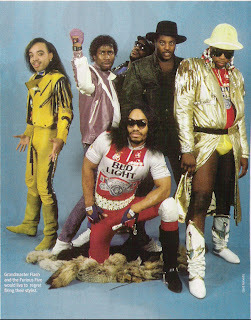 Click on the title - Grandmaster Flash and the Furious Five - to see their faboulousness. Don't forget to take note of their extremely cool outfits, hahaha. I own the pith helmet outfit. Oh my gosh. I love them so much. I love 'White Lines'. I love their fashion sense too. They took it to a whole new level. "White lines" was a cool groove though. Great blast from the past. . .
LOVE their outfit ; just this morning I was looking in my supermarket at the dvd's and I saw Staying Alive with John Travolta, I was like OMG, the moves, the outfits ! Okay, so where do you think I could find a yellow banana hammock like that for my husband? I'm in love with the boots, though. HOTNESS TO THE FIFTH POWER!!! there is nothing around like this today. not at all. I'm not sure I'm familar with them. But I'm sure they're fun. word ver: "Juddle"...a mix of Ashley Judd and "cuddle"